A second harvest of winter vegetables comes with wise vegetable planning and planting for your vegetable garden. During the month of September, if you live in the northern hemisphere, your vegetable garden has started to peak and you are busy canning those tomatoes and making those pickles and planning for vegetable storage for those lean winter months. However, if you plant again in September with cold loving, hardy plants, even in frost zones, you can get an extended harvest out of your vegetable garden. The best thing about vegetable planting during this time is that the cooler weather means that there are fewer garden pests attacking your plants and diseases either slow down or disappear completely during the colder months. Harvesting your second harvest is then easier than the first harvest. Don’t think that it is too cold in your area. Check the moon planting calendar for optimal planting times, reach for those seeds and start planting kale , cabbage , chard , rocket , claytonia , mache , minutina , mizuna , endive , spinach , carrots , turnips , rutabagas and planting broccoli so that you can harvest your vegetables well into November. Mid –September frosts may be common in your area, but if you are able to create a micro climate on your property it is still possible to harvest broccoli, chard, cabbage, rocket and other cold-weather vegetables. Radicchio is another gem for a winter second harvest crop. If you leave the stump of the radicchio plant in the soil over winter, come spring time it will re-sprout and give you perfect heads in the spring. Spinach does the same thing. Plant it in the fall and it will produce some lovely leaves before the winter weather gets to it. Mulch it well and it will start growing again when the weather warms up in the spring. 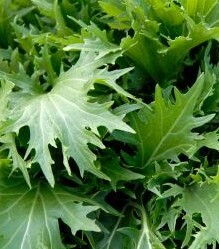 Endives, spinach, radicchio and many Asian greens also grow well in the cold. Chard , lettuce , leeks and parsley can also take the cold. At this time deep watering is really important for growing your winter vegetables – 2 inches twice a week, and mulching around your plants will keep the moisture in and retain the heat in the soil for longer. In October stop watering and you should be able to harvest right through the snow. You may not find space among your vegetables to plant your seeds for your second harvest. However, if you find a small area that is suitable to raise your seedlings for transplanting later on, use this until you have managed to clear some beds for your next planting season. You really need to plant out your seedlings that have been planted in July for optimal growth. When days are shorter and the vegetables don’t get a lot of sun, they start to slow down in their growth. By October, your plants are not going to grow much more. If you haven’t started your own seedlings in July, then try and source them from a good nursery. Make sure that you have purchased frost or cold-hardy varieties. Good cold winter vegetables grow better than you imagined. Kale is very good, even when exposed to frost and is easy to grow under cold conditions, even when the snow comes and temperatures plummet to zero and below. Collards are also hardy. In areas where the weather is milder broccoli can last throughout the winter. Root crops will also do well for a second harvest, carrots , parsnips , beetroot and other root crops are protected from the cold by the soil they are growing in. However, mulching is really important to keep the roots warm. A layer of 8 inches of straw will protect them. If you want to get really fancy, you can protect your plants with a small plastic tunnel of metal hoops and plastic covering the beds. It is important to still make sure that your plants are well-manured and fed during this period of second harvest. It is also important to be vigilant so that when you have a freeze/thaw and the plants are lifted out of the soil you are able to resettle them back into the soil. Look after your fall garden well and enjoy extending your harvest. 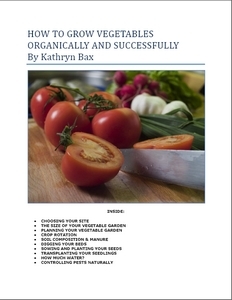 free e-Book "Growing Vegetables Organically and Successfully" When I sign up to receive the monthly homesteading newsletter. We do not spam you or give your e-mail address to others.